The LEADING LIGHT® Wnt Reporter Assay Starter Kit is a cell-based luciferase activity test suitable for 96 well plate format. The system contains an engineered 3T3 mouse fibroblast cell line, which expresses the firefly luciferase reporter gene under the control of Wnt-responsive promoters (TCF/LEF). The luciferase activity from the reporter gene in this cell line can be up-regulated in a dose-dependent manner upon the addition of exogenous Wnt protein/Wnt agonist or down-regulated by a further addition of a Wnt antagonist to the cell culture medium. This system can be used to elucidate the functions/activities of different Wnt-related ligands such as Wnt, DKK, etc. This system can also be used for screening small molecules and antibodies for their ability to act as Wnt inhibitors or Wnt agonists. The assay has been used successfully in different assay formats (including HTS applications) to identify several distinct categories of small molecule compounds that modulate the Wnt signaling pathway. Schematic of the canonical Wnt signaling pathway and its components. Luciferase activity from the reporter gene in the LEADING LIGHT® Wnt reporter cell line can be up- or down-regulated in a dose-dependent manner upon the addition of exogenous Wnt protein/Wnt agonist or Wnt antagonist (Dkk) to the cell culture medium. 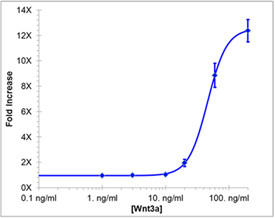 Wnt reporter cells were treated with indicated doses of Wnt3a protein. After Wnt3a treatment, the luciferase activity assay was performed. The chemiluminescence in the Wnt3a-treated cells increased in a dose-dependent manner. Activation of Wnt reporter gene by LiCl in the Wnt Reporter cell system. Cells were treated with the indicated doses of LiCl. After LiCl treatment, luciferase activity was measured. 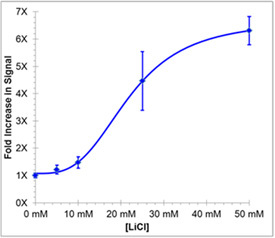 The chemiluminescence in the LiCl-treated cells increased in a dose-dependent fashion. Reporter cells were treated with the indicated doses of Dkk-1 in the presence of 200 ng/mL (in-well) Wnt3a. 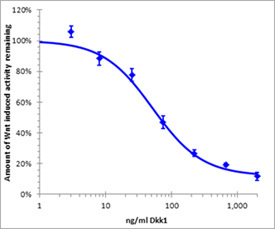 After Dkk-1 treatment, luciferase activity in the cells was measured. Dkk-1 inhibits Wnt3a-elevated luciferase levels in a dose dependent manner. Quality Control: The luciferase activity in Wnt3a (100ng/ml, in-well concentration) treated cells is at least 5-fold higher than that in untreated cells. Use/Stability: Upon receipt, remove the vial of reporter cell line from the box and store in liquid nitrogen. Store the remaining reagents at –80°C. When stored properly, these reagents are stable for one year from date received. Scientific Background: Wnt ligands bind to Frizzled (Fz) and LRP5/6 receptors to trigger a signaling cascade that leads to stabilization of beta-catenin, which can enter into the nucleus to form a complex with T cell transcription factor (TCF/LEF) to activate Wnt target gene expression. Canonical Wnt signaling is required for embryo-genesis and adult tissue maintenance and is involved in tumorigenesis and development of many human degenerative diseases. Studies relating to Wnt signaling have advanced research in molecular embryology, stem cell biology, tumorigenesis, regenerative medicine, and rational drug discovery. Cell-Based Screening of Focused Bioactive Compound Libraries: Assessing Small Molecule Modulators of the Canonical Wnt Signaling and Autophagy-Lysosome Pathways.